2017 Ford Flex For Sale In Vernon, Kelowna, Okanagan, BC. Expressive style and a bold design come forward with the 2017 Ford Flex. This crossover SUV model offers you a range of versatile options and comforts, and with the Ford performance and capability you expect. Featuring four doors and seating for up to seven individuals, the 2017 Ford Flex is perfect for busy families. Available Flex trim levels include the SE, SEL and Limited. Sit back in a refined cabin environment with the 2017 Ford Flex as you enjoy a spacious ergonomic layout. Luxury is apparent through the available ambient lighting and Push Button Start feature that allows you to start the engine without removing your keys from your pocket, bag or purse. Throughout the cabin, you will find the available leather-trimmed seats with optional heating and cooling for the front row. Through the Dual-Zone Electronic Automatic Temperature Control, you have the ability to have two different front temperatures at the simultaneously. Keep your hands on the wheel with ease as you grip the available perforated leather-wrapped and heated steering wheel with mounted cruise, audio and 5-way controls. 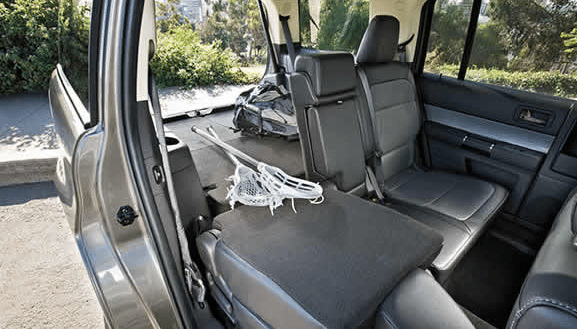 Expand your cargo possibilities through a spacious interior design with 2nd-row reclining bucket seats, a 50/50-split 3rd-row fold-flat bench seat and up to 2,356 L (83.2 cubic ft.) of storage space with the rear seats folded. Dominance is portrayed on the exterior of the 2017 Ford Flex as you encounter a unique blend of power and capability. Refined details such as the chrome door handles and grooved door panels catch the attention of all as the optional power liftgate delivers convenience for loading your cargo with full hands. Enjoy the available multi-panel Vista Roof provides lighting and fresh air to all three rows. Visibility is enhanced by the High-Intensity Discharge headlights, fog lights and LED taillights as you increase your ability to see and be seen on the road. 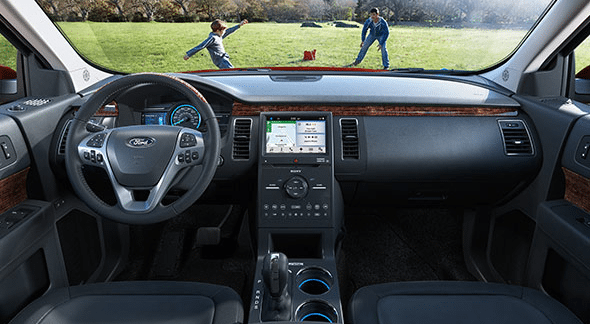 Connect to the outside world with ease in the 2017 Ford Flex as you engage with a series of advanced technological features that promote connectivity without compromising safety. Take the available SYNC 3 communication system with Bluetooth capability and Next Generation Voice-Activated Technology for an ability to access your compatible devices without the use of your hands. 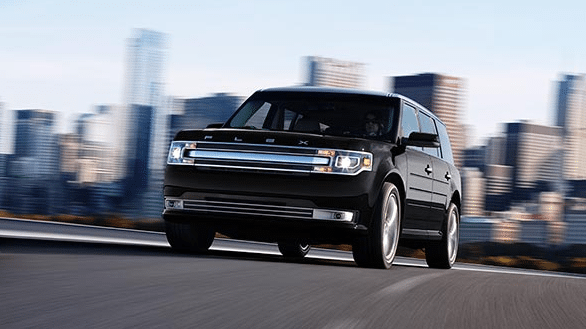 You are also offered an optional navigation system that can guide you to an array of destinations through turn-by-turn directions in the 2017 Ford Flex. Introduce some of your personal ideas and preferences with the 2017 Ford Flex and a selection of available Genuine Ford Parts and Accessories. You can keep your interior organized with the help of soft-sided, folding cargo organizers or cargo nets as the available all-weather floor mats offer protection from unwanted snow, mud and debris. Accentuate your exterior style with the help of the optional hood badge as the doorsill plates and splash guards provide protection. Drive with increased determination in the 2017 Ford Flex with its two powerful engine options. Thanks to the Intelligent All-Wheel Drive System you are given a more balanced torque between the front and rear wheels for enhanced handling and traction. Furthering this handling is the fluid agility of the 6-Speed Selectshift Automatic Transmission as it delivers responsive acceleration. Expand your opportunities in the 2017 Ford Flex as you encounter a reliable and capable design that was built to meet the ever-changing needs of your family. 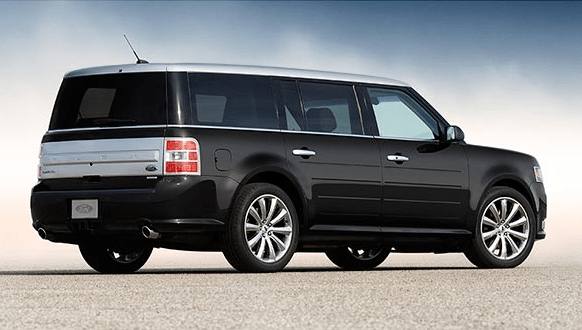 Experience the Ford Flex with an in-person test drive to see what all the hype is about! Come explore the 2017 Ford Flex at your local Vernon Ford Dealer – Watkin Motors Ford. We have the best selection of new Ford trucks, SUVs and sedans in the Okanagan Valley! Book your test drive at Watkin Motors Ford, Taking Care Of The Okanagan For Life!